Are You Ready for a Tucson-Style Shooting? The Tucson shooting that left six people dead and 14 injured, including Rep. Gabrielle Giffords, was especially frightening not only because its primary targets included women, children and seniors but also because it seemed to come out of nowhere. It's what police call an "active shooter attack," defined by Homeland Security as "an individual actively engaged in killing or attempting to kill people in a confined and populated area." Nearly all such attacks are carried out by a single attacker, making them very difficult to detect in advance. Never approach arriving police officers. Evacuate with "hands empty, hands open and hands up," in the words of Capt. Michael Riggio. If unable to avoid a confrontation with the shooter, attack him "as aggressively and violently" as possible, Riggio said. Use staplers, scissors, furniture and pens as weapons. Gang up on the shooter. The more people who attack the shooter, the better the chance they will be able to stop him. Forty-six percent of active shootings from 1996 to 2010 have been ended by the use of force, either by law enforcement or bystanders. Forty percent of the shooters committed suicide, said Jessica Tisch, director of policy and planning in the HYPD counter-terrorism unit. Shooters are overwhelmingly male. Only 8 out of 202 cases involved female attackers. The median age of shooters is 35. School shooters tend to be 15-19 years old, workplace shooters 35-44. 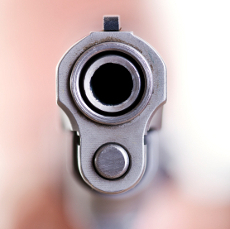 Fewer than one-third of workplace shootings involved former employees. In many cases, active shooter attacks resulted from disagreements and grievances among current employees. Less than one-third (29%) of attacks took place in schools, while one-half occurred at commercial facilities, including office buildings, factories and warehouses. 36% of active shooter attacks involved more than one weapon. In several cases, attackers ued firearms stolen from relatives or friends. The complete NYPD report, "Active Shooter: Recommendations and Analysis for Risk Mitigation" is available online (pdf file).